Mary Hayden—continued to write on historical and feminist topics until shortly before her death in 1942. The recent article on Dorothy Macardle (HI 15.3, May/June 2007) mentions other accomplished Irish female historians of the Free State period, including Mary Hayden. She is one whose long and active life deserves to be better known. Like Macardle, she wrote one history book. A short history of the Irish people, published in November 1921 and popularly known to generations of students as ‘Hayden and Moonan’, became a standard textbook in use in Irish schools and colleges into the 1960s. Mary Hayden wrote most of the book, apart from the chapters on the earliest period and on Gaelic literature, which were the work of George A. Moonan, a lecturer in the Gaelic League Leinster College of Irish. Mary Hayden was born in Dublin in 1862. Her parents, Mary Ann Ryan and Thomas Hayden, were both of Tipperary origin. Thomas Hayden was a medical doctor, a professor in the Catholic University School of Medicine, an associate of the rector of the Catholic University, John Henry Newman, and a member of the senate of the Royal University of Ireland, established by charter in 1880. The family was Catholic but Thomas’s father had been Protestant, and this mixed inheritance, combined with her years at Alexandra College, may well have contributed to Mary’s lack of sectarian consciousness and her easy relationship with those of another, or no, religion. Mary was educated in several convent schools before attending Alexandra. She was one of the earliest to avail of the opportunity for women to take degrees when the Royal University was established. It was not a teaching university, and women did not have access to teaching by the university fellows, who were all appointed to men’s colleges. Mary obtained a BA in modern languages in 1885 (the second year in which degrees were conferred on women) and an MA in 1887; in 1895 she was one of the first two women to win the Royal University junior fellowship. She was by then enjoying a busy life of teaching and writing, interspersed with a good deal of travel, made possible by a modest inheritance from her father, who had died in 1881, combined with her own small earnings. Enjoying the cultural life of late nineteenth-century Dublin, she became friendly with many of its leading figures such as George Sigerson, W. B. Yeats, Douglas Hyde and Patrick Pearse, attending the National Literary Society, the Contemporary Club and the Gaelic League. The Celtic Revival and her enthusiasm for the Irish language were strong influences on her developing sense of nationalism. She had earlier had no interest in Irish politics, and little sense of national identity. Contemporaneously she was becoming conscious of issues of rights for women, influenced by her liberal education at Alexandra College and her continued association with the school, as past pupil and sometimes teacher. She later dated her feminism from about 1900, and named as her three most significant influences two teachers at Alexandra—Alice Oldham and Isabella Mulvany—and Anna Haslam, founder of the Irish Women’s Suffrage and Local Government Association. Hayden’s first involvement in a campaign was for the admission of women to teaching and other facilities of the universities. In 1902 she was a founding member and vice-president of the Irish Association of Women Graduates and Candidate Graduates, the efforts of which were largely responsible for the inclusion of women in the 1908 legislation that established the National University of Ireland and its constituent colleges. Her academic credentials were recognised by her appointment to the foundation staff of University College Dublin, and in 1911 she became the first holder of the professorship of modern Irish history. She was also appointed to the governing body of the college and to the senate of the National University, a small but significant acknowledgement of the claims being made by women, in Ireland and elsewhere, for a role in various aspects of public life. Mary Hayden held her professorship for 27 years, to be succeeded by her one-time student R. Dudley Edwards. She was an effective and competent teacher, described by former students of the ’20s and ’30s as formidable, alert and dominant, with the theatre on the top floor in Earlsfort Terrace crowded for her lectures. Her great mentor in Alexandra, Isabella Mulvany, wrote of Hayden that to ‘her wide knowledge there is added a vivacity and a strong human interest which constitute her a brilliant and eminently successful lecturer’. Hayden wrote many articles and book reviews on literary, historical and feminist subjects, published in the New Ireland Review, Studies and other journals. But the work for which she was most widely remembered was A short history of the Irish people, co-authored with George Moonan. The publisher, Talbot Press, initially planned a shorter book, to be published in 1917. By the time it appeared in 1921, the work had become much longer and more expensive to produce than anticipated—the publisher ruefully commenting that it was more likely to ‘bring honour and glory to the authors than profit to the publishers’, who would have to sell 3,000 copies to clear the initial cost. There were several revised editions, and the book continued to be widely used for two decades after Hayden’s death in 1942. Though based on secondary sources, the work was a good interpretation of contemporary research, which, in the view of Professor Mary O’Dowd (Queen’s University, Belfast), made a substantial contribution to shaping a knowledge of Irish history for several generations of Irish students. After Hayden’s death, Irish Historical Studies commented on the book that ‘during the last twenty years, it has been the most widely used school and college text in Irish history’. The authors acknowledged that the book was written ‘from a frankly national stand point’, was based on their experience in teaching history, and made no claim to originality other than in the presentation and treatment of the subject. Events were treated in the context of their own times, ‘but are judged by their final effects upon the destinies of the nation’. Hayden was a constitutional nationalist, and the book, written and published before the Treaty and the Civil War, was intended to provide the incipient state with an acceptable account of its history. It conformed to the post-colonial emphasis of the new state that the chief aim of teaching Irish history should be to inculcate national pride and self-respect. A modern scholar, Nadia Smith, has commented that the history narrated in the book ‘was acceptable in a post-revolutionary state whose legitimacy was questioned by more radical nationalists’. 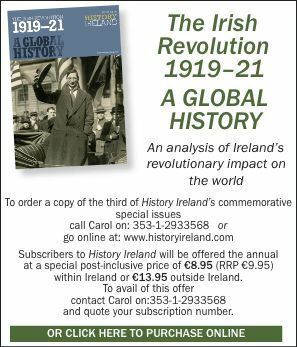 In an Irish Independent review, ‘M.R.’ considered the book the best and most complete view so far ‘of the history of our country and of the forces that shaped its destiny’. ‘M.R.’ was pleased with the estimation of Wolfe Tone for his keen perception, practicality and immense energy, but regretted the omission from the history of ‘the late Archbishop of Dublin’ (William Walsh). Another contemporary reviewer, Helena Concannon, criticised the book for its omission of the names of President Griffith, ex-President de Valera and Dáil Éireann. These omissions were rectified in later editions, when the work was extended to 1924, as recorded in an obituary note in Irish Historical Studies, probably written by R. Dudley Edwards, which referred to Hayden’s high degree of objectivity in the original book, and continued that in subsequent editions ‘her strong personal feelings on more recent events somewhat obtruded into her narrative’. In fact, the dissatisfaction of de Valera and his supporters with their treatment by established historians was to result in the encouragement of Dorothy Macardle to write The Irish Republic. Hayden continued to write on historical and feminist topics until shortly before her death. At the same time she was an active feminist, prominently engaged in various issues of women’s rights. She was a leading speaker and writer in the campaign for women’s suffrage. A supporter of the Treaty, she joined in protests against Free State governments for their reactionary attitude to women, for instance on their virtual exclusion from jury service, on their restricted employment prospects in the civil service and elsewhere, and on certain provisions of the 1937 constitution. Women’s rights as human beings and as citizens was the cause nearest to her heart, in the words of her friend Agnes O’Farrelly. Joyce Padbury has an MA in history and until retirement worked in administration in University College Dublin. She is currently working on a life of Mary Hayden.